Grown in the Mediterranean region as far back as 2,000 B.C., beet cultivation spread to Babylonia in the eighth century, then to China around 850 A.D. Beets, along with their greens, belong to the Goosefoot family, known as Chenopodiaceae. Within the botanical family, beet greens are factored alongside spinach, Swiss chard, quinoa, lamb's quarter, and a number of other wild plants, which means that beet greens can be placed in the “dark, leafy” category. Because they are a cool season crop, beets grow quickly and can survive almost freezing temperatures, making them a favorite of northern gardeners. Beets and their greens also enjoy a longer than normal growing season. It’s best to use beet greens within two or three days after refrigeration. Enjoy beet greens by themselves as a salad or with other leafy vegetables, or sauté them in a bit of olive oil or balsamic vinegar and salt for a delicious side dish. As if that weren' enough, studies have also shown that the vitamin K in beet greens contains blood clotting properties, helps ward off osteoporosis, works with calcium to boost bone strength, and may also play a role in fighting Alzheimer’s disease. 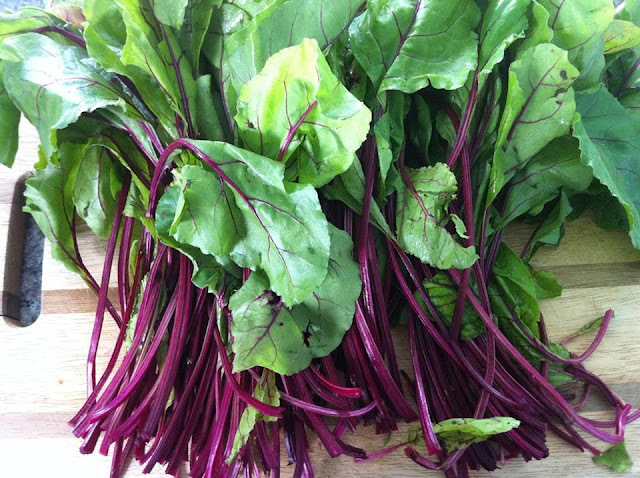 Beet greens have a higher iron content than spinach, and a higher nutritional value than the beetroot itself. The vitamin A content in beet greens helps strengthen the immune system and stimulates production of antibodies and white blood cells. The beta-carotene in vitamin A is a known antioxidant that can fight the effects of free radicals in the body along with cancer and heart disease. Doctors often recommend vitamin A to patients at risk of developing night blindness. Wash beets thoroughly, leaving skins on. (It’s easier to peel the beets once they’ve been roasted.) Remove the greens and rinse, removing any large stems and set aside. Place beets in a small baking dish or roasting pan, toss with half of the olive oil, cover and bake for 45 to 60 minutes or until tender. Serve with red wine vinegar or butter and salt and pepper. For the greens: heat remaining olive oil in a skillet over medium-low heat. Add garlic and onion and cook for one minute. Tear the beet greens into 2 to 3 inch pieces, and add to skillet, stirring until wilted and tender. Season with salt and pepper. Cultivated since prehistoric times, early Romans only ate the beet tops, leaving the beet roots for medicinal purposes. Beets and their greens offer not only two great dishes for the table, but two sets of nutritional attributes as well. In the greens, vitamins A and K, especially, offer a plethora of benefits for the whole body, from your brain to your blood to your eyes. In the kitchen, beet greens can be enjoyed sautéed or as a salad. Another way to get nutrients from beet greens is through juicing.